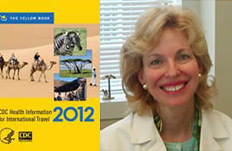 Enter a travel clinic or primary care office anywhere in the U.S. and professor Phyllis Kozarsky hopes you'll see one bright yellow reference manual on the shelves: CDC Health Information for International Travel (Oxford University Press, 2011). Kozarsky is medical director at Emory's TravelWell Clinic, and serves as a medical editor for the U.S. Center for Disease Control and Prevention's biennial "yellow book." The 2012 edition, released this month, is designed to help doctors advise patients about health concerns when traveling around the globe. As Kozarsky explains, the book includes not only immunization recommendations but also advice on handling situational health risks, such as driving on rural, unlit roads at night. And sections of the book are devoted to recommendations for items to bring on your journey -- from portable water filters in India to sunscreen in Argentina.